Many customers ask what is the standard size of a basketball court. Here we have provided basketball gym floor layouts with dimensions for High School basketball courts, NCAA basketball courts, and NBA basketball courts. If you would like a gym floor design layout showing your schools logo and game lines please contact us. 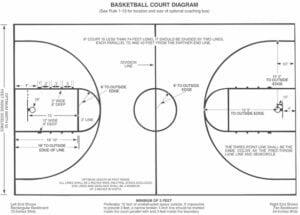 Please contact us for court layouts and diagrams for any other sports.